File Photo: Notre Dame was seeded as a number one seed in the sectional tournament seeding released Sunday afternoon, will face the winner of New Boston and Eastern Pike. PORTSMOUTH – The release of the sectional matchup’s from the Southeast Athletic District Board Sunday afternoon means that the end of the high school girls’ basketball regular season is closer than any of us would like, but also points towards tournament time and the time to crown new sectional, district, regional, and state champions. In the release, Scioto County’s twelve schools were seeded based on their records and play throughout the regular season to determine who would play who in the first and second rounds of the tournament. In the Division III ranks, the Wheelersburg Pirates were Scioto County’s highest representative by earning a three seed in their district with a 15-4 record. Wheelersburg will begin tournament play with an opening sectional matchup with Adena at Valley High School on Thursday February 14th at 6:15 p.m. The Minford Falcons (13-6), Scioto County’s second highest seeded team in Division III at a five seed, will square off against Portsmouth (7-12), a twelve seed on Monday February 11th at 8:30 p.m. at Valley High School. South Webster (8-10), seeded as a nine seed, will face eighth seeded Piketon (12-8) on Monday February 11th at 5:00 p.m. at Valley High School. 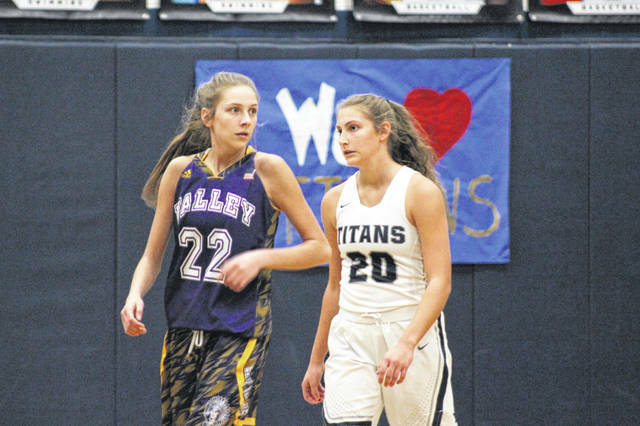 Valley (8-12), will travel to Jackson High School as a ten seed to face seven seed Westfall (8-11) on Wednesday February 13th at 8:00 p.m. The Northwest Mohawks (9-11), also a ten seed, will face seven seeded Ironton (9-9) on Wednesday February 13th at Valley High School on February 13th at 6:15 p.m.
Portsmouth West (3-14), a fifteen seed, will face off against Lynchburg-Clay (16-2) in their sectional matchup on Wednesday February 13th at 6:15 p.m. In Division IV action, the Notre Dame Titans (16-1) received a number one seed and will play host to the winner of the Glenwood New Boston (6-14) and Eastern (Pike) on Thursday February 14th at 6:15 p.m. at Northwest HS. To determine who fill face the Titans, New Boston and Eastern will square off on Monday February 11th at 7:00 p.m. at Northwest HS. The Clay Panthers (11-7) received a three seed in their sectional seeding and will face the winner of Western (8-10) and White Oak (0-20) on Saturday February 16th at 2:45 p.m. at Northwest HS. Scioto County’s two remaining teams, the seven seeded Green Bobcats (8-10) and the tenth seeded East Tartans (1-16) will face off at Northwest HS on Wednesday February 13th at 6:15 for a date with second seeded Peebles Saturday at Northwest. Stay tuned for previews, recaps, and updates from all sectional matchups featuring Scioto County’s teams in both boys’ and girls’ basketball as both tournaments progress.